The following report provides an overview of my research with partners of New Zealand’s emergency responders and briefly summarises the results. This research was part of a PhD thesis completed at the University of Auckland. The research aimed to study how partners/spouses manage stressful events linked to being in a relationship with an emergency responder. This research involved partners of New Zealand’s police officers, firefighters, paramedic/ambulance officers and defence force members and includes those in relationships where both individuals are emergency responders. Approved by the University of Auckland Human Ethics Committee approval, the research was also vetted and approved by the NZ Police, the NZ Police Association, the NZ Fire Service, the New Zealand Professional Firefighters Union, the United Fire Brigades’ Association, St. John NZ and the NZ Defence Force. While Wellington Free Ambulance did not engage with this research, partners of WFA ambulance officers were eligible to participate in the online survey component of the study. Police, fire, ambulance and defence force personnel (emergency responders) risk experiencing dangerous activities, traumatic events and the development of post-traumatic stress disorder. In turn, spouses/partners (partners) of these emergency responders risk developing secondary traumatic stress as they are exposed vicariously to the trauma through association with their responders. This research aimed to address the question: How do the partners of NZ’s emergency responders respond to work stress experienced by their emergency responder? The study posed six research questions and six hypotheses to identify resources and barriers towards effective management of secondary traumatic stress. A mixed methods approach assessed the experience of secondary traumatic stress among the partners of New Zealand’s emergency responders. The survey assessed secondary traumatic stress in partners, perceived stigma towards help-seeking, partner resilience and relationship satisfaction. It asked if the emergency responder’s organisation invited partners to events, offered inductions, or offered informational resources to manage stress. Partners were asked who they turned to when dealing with stressful situations experienced by their responder. The survey concluded with open-ended questions about organisational engagement with the partners and responders. The engagement with participants (the partners of emergency responders) was divided into three stages. I interviewed 12 emergency responder partners in July and August 2014. Those interviews along with information from subject matter experts informed the creation of an online survey. A pilot of the survey was tested at the end of 2014. 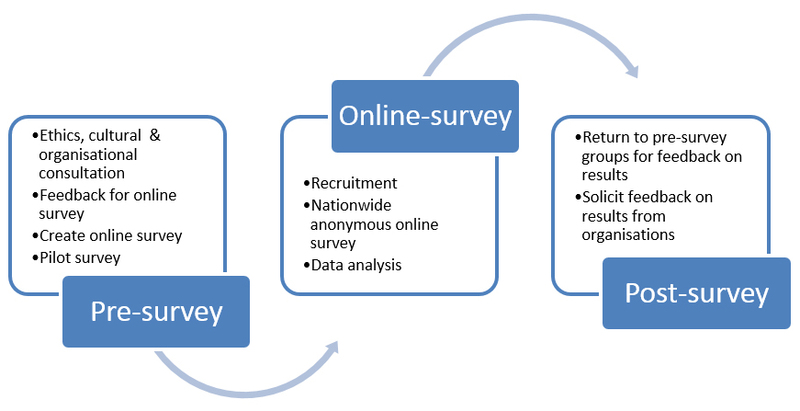 Twenty-three non-responders (including colleagues, subject matter experts and cultural consultants) and eight partners of emergency responders were asked to provide feedback on the clarity of questions and the functionality of the online self-complete survey. Modifications were made to the survey based on feedback. The anonymous survey was available online from December 12, 2014 until April 8, 2015. A total of 945 participants began the survey, 694 participants completing the entire survey. Data were analysed and incorporated into the thesis. Partners of emergency responders who participated in the pre-survey interviews and pilot were contacted to provide feedback on the results. Nine were available to meet and provided feedback. Organisations were also provided with results as well as with a copy of the thesis, and were asked to provide feedback. Their feedback was incorporated into the findings for the thesis. Themes were identified from analysis of the qualitative responses given by the 835 partners of NZ responders. A hypothesised model was produced and tested using multiple regression (n=664) which led to the creation of a structural equation model (SEM) (n=547) to describe interactions between resources and barriers. The study found that 20–35% of partners experience major symptoms of STS and almost 50% feel unsupported when managing stressful issues experienced by their emergency responders. One of the models found that positive organisational communication benefits partners and reduces psychosocial risks. The thematic analyses endorsed increasing partner self-efficacy and encourages organisations to identify and provide resources accessible to partners. These results highlight the challenges faced by partners of emergency responders and suggest that direct organisational engagement with the partners of their employees could reduce risks associated with secondary exposure to trauma. A complete set of results has been provided to the NZ Police, Fire, Defence Force, and St. John Ambulance. The same results will be publically available through the University of Auckland’s Library of Theses and Dissertations Catalogue once submitted. Provides free advice from trained registered nurses.